I spent all day yesterday working on my Craft Room. 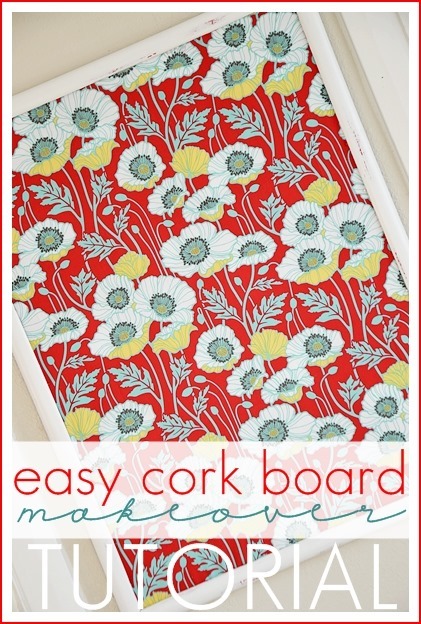 One of the projects I started and finished was giving my old Cork Board a quick makeover using fabric. 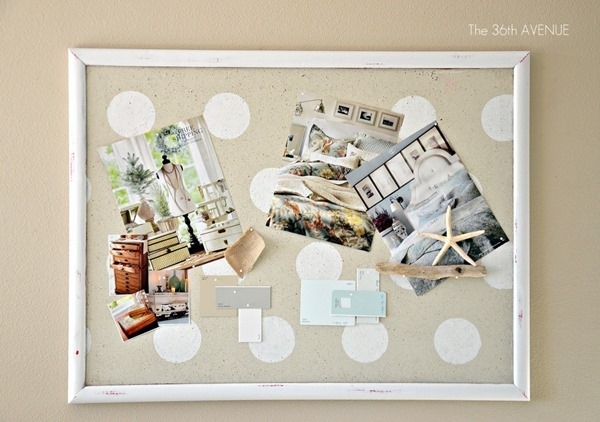 I love how our Polka Dot Pin Board used to look. But for the new room the color was too close to the wall and I wanted to make it pop. I used half of a yard of fabric for this project. I cut the fabric about 1 inch wider than the board. With a butter knife I pushed the fabric inbetween the frame and the board, working my way around. To make the fabric stay I used pins of the same color. You want to pin them in an angled position. The colors of the pins and the fabric blend so well that I can hardly tell that they are there..
After I was done with the board I used the other half of a yard to make a new ironing board cover. 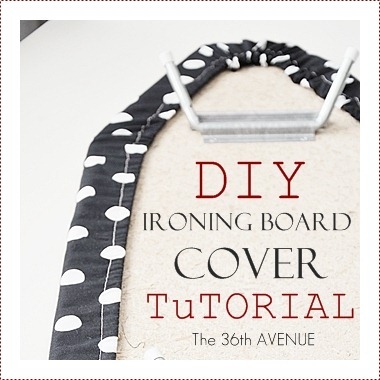 You can click here to learn how to make an ironing board cover. 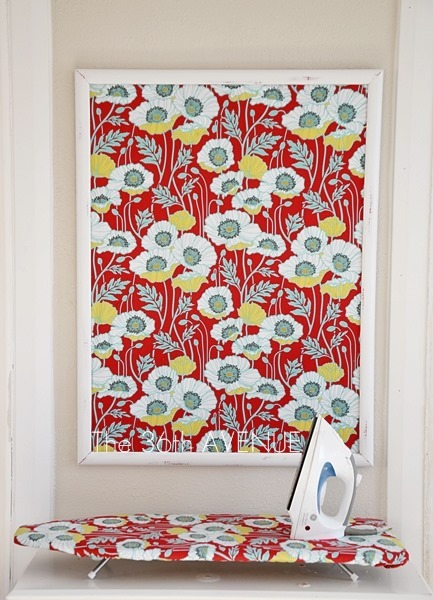 I love this ironing little area. It is amazing what a bit of color and fabric can do. Colors have the power to create a feeling in a room. They can make you happy, sad, hungry, or angry. My new Craft Room has a ton of natural light, and most of the furniture is white. I want the fabrics in the room to stand out and fill the space with colorful patterns that inspire me to create. Here is a sneak peek of the curtains. Make sure to come back at 10:30 pm to link up your projects to this week’s link party! I love this idea…and it’s so simple. Definitely got to do this one…thanks. Love your fabric. It is a burst of fun color. Excellent choice! I absolutely LOVE this fabric Desiree! Your update is so pretty 🙂 Cannot wait to see what else you have done with your fabulous craft room!! That’s cute! 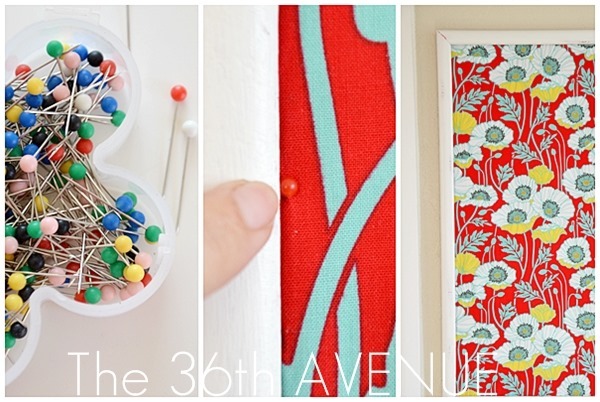 I’m pinning- I have a cork board right over my sewing machine. I love how easy it is to give it a new look. Then if you want to change it again you can use the fabric for something else. 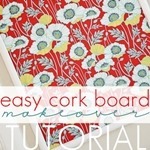 Showing this to my daughter who has the same size and color old cork board. She is currently redoing her room so I know she will be on top of this once she gets some fabric. I love giving a room a new look. Love it! The fabric is gorgeous! Thank you so much Jen… Have a fantastic day! Oh wow. More and more I am being drawn into bright splashes of color. Great idea, Desiree! Thank you so much Laura and thank you for stopping by! 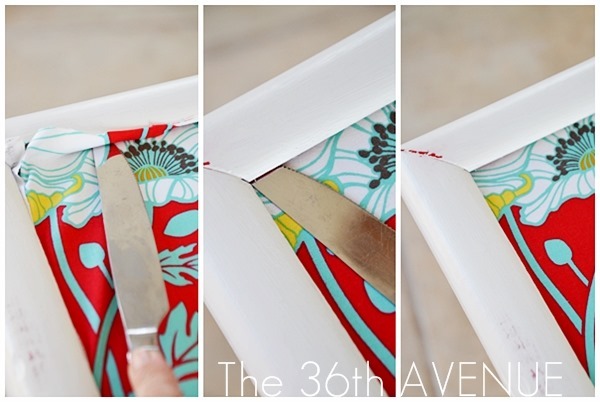 This is so fabulous…so easy…so WONDERFUL! 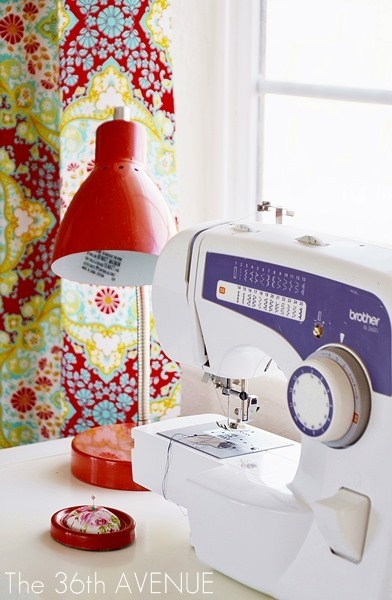 That fabric has your name on it! Loving color more and more with each day…thanks for the inspiration this morning my friend…as always…you rock! hugs! How are you beautiful? It is so good to hear from you. Thank you so much for stopping by and taking the time to say hi. You made my day. Love you! Desiree your room looks great, that fabric is beautiful! I’m feeling like I need a pop of color around here too!